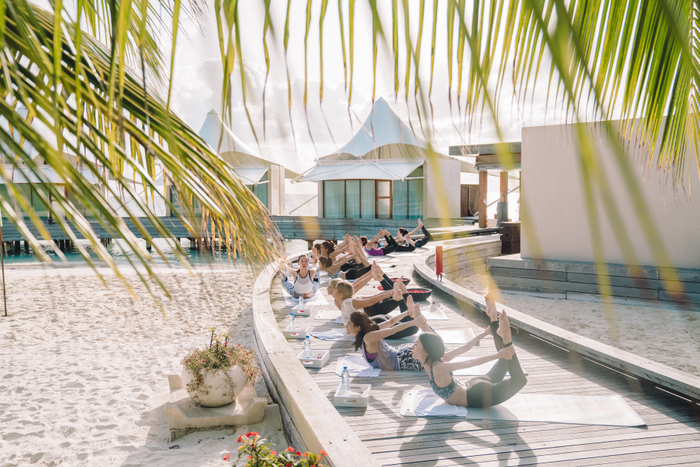 W Maldives partnered with the none other Reebok Women, one of the most famous sports brand to host prominent influencers from seven countries, ready to redefine the notion of ultimate perfection with the #PerfectNever campaign. Reebok having invited 12 beautiful ladies from Southeast Asia and the Pacific to W Maldives as the representatives of their #PerfectNever campaign in the region, they aim to redefine the notion of perfection. The influencers include from fashion bloggers, singers to Miss Universe Malaysia 2016. With collectively 7.7 million followers on social media, these beautiful ladies aim to show the world that there is more to these women than the airbrushed images on their profiles. During this 3 day event, the most talked about issues include, comparison of bodies, fat-shaming/body shaming, personal insecurities and the ultimate society’s definition of beautiful. With 7AM yoga session to High Intensity Training (HIIT) at sunset, its safe to say that boundaries are being pushed. The #PerfectNever digital campaign launched on October 1st , where influencers shared their own #perfectNever stories through a 60 seconds’ video. An online contest is also organized for residents of Southeast Asia and the Pacific, in which they may enter by sharing their #PerfectNever stories online. The grand prize is an all-expense paid three-night stay at W Maldives for two, sponsored by both brands.